This entry was posted in Reason to Live, Ze Rest of Ze Ztuffm on 04/25/2010 by deanwebb. This entry was posted in Reason to Live on 04/23/2010 by deanwebb. OK, I’ll accept the guy probably is a terrorist. He probably is making war on the US and killing him might very well put an end to the further plans he has to kill innocent people. He’s making war on me and my people, so, yes, he should be a target for the violence of war. What bothers me is that the justification used – a statement from the government – can be used against anyone, anywhere. That’s not the kind of power I want any government to have. The next bother I have is that the administration is not trying to cloud the issue. It’s come right out and stated it plans to assassinate this man. When will assassination of leaders hostile to US interests become as open as this? The arrogance of this declaration is as appalling as its criminality. What is further appalling is that few voices are speaking against this. Those who deplored Bush’s erosion of civil liberties are silent on this move of Obama’s. Those who deplore Obama are silent, too, as if they do not wish to indict their darling baby Bush with criticism of this excess of power. This entry was posted in US Government on 04/21/2010 by deanwebb. This entry was posted in Pictures on 04/17/2010 by deanwebb. Justice Stevens is contemplating retirement from the Supreme Court. Why now? Well, Stevens is a liberal and he’d like to see another liberal justice replace him. Obama is likely to appoint a liberal, so the timing seems right. Ironically, Stevens originally thought he was a conservative Republican when Gerald Ford appointed him back in 1975. No president can be sure of what he’s going to get from a Supreme Court appointment. That’s why Mr. Stevens’ departure may not be timed so right. This is an election year, and the Republicans are more feisty than ever to rain on Obama’s parade. Would they threaten a filibuster over a liberal nominee? Absolutely. Politics is not about doing what’s right for the nation. It’s about doing what’s right for one’s self, one’s party, and one’s PAC contributors. Obama doesn’t want to upset independent voters, but he’d also like to fire up his liberal base, which he offended with the watered-down health care bill. In an America where the Tea Party is increasingly more vocal and looking set to hijack the Republicans, perhaps going with the middle-of-the-road would be the best course of action. Let Palin & Co. alienate the middle: Obama & Co. can get a broader majority with the left and that alienated middle. His stature is good: he need only campaign a day for each marginal election to pump up the voters and get them to turn out to support his supporters. A moderate on the court, however, will not do much to change its conservative nature. That’s why some Democrats are politely asking Justice Stevens to wait another year and retire after the election. This entry was posted in US Government on 04/10/2010 by deanwebb. Where to start with this one… how about a Greg Palast report from 2007? It’s a bit dated, but highly pertinent. It’s six minutes long, and it’s free. It also didn’t air in the USA, except on LinkTV. When it aired in England, it led to a change in the law to prevent vulture funds from turning third-world debt relief into a cash cow. US Representative John Conyers, who watches Palast on the BBC, walked into the Oval Office and confronted George Bush himself about the issue. Bush denied knowing anything about it, and Conyers let Bush know that he knew about it. Bush did nothing about it. Neither has Obama. In the meantime, US-based vulture funds continue to sue third-world nations for the full value of discounted debt. In many cases, that means US aid given directly to a foreign nation winds up in the bank account of a vulture fund manager. This entry was posted in US Government, World Hellhole Report on 04/09/2010 by deanwebb. If anyone could be an American Dictator, it would be Sarah Palin. She looks manipulable, but she also believes in her destiny. Not in a rational, “believe in yourself!” kind of way, but in a creepy totalitarian Triumph of the Will sort of way. And forget comparing such a mind to anyone else: she’s American, and when America goes totalitarian, it will do so in a way that will be bigger, badder, and more efficient than any other totalitarian regime. The people expecting her to be easy to bend will get her into office, then they will be as shocked as everyone but Palin at what she does with that office. 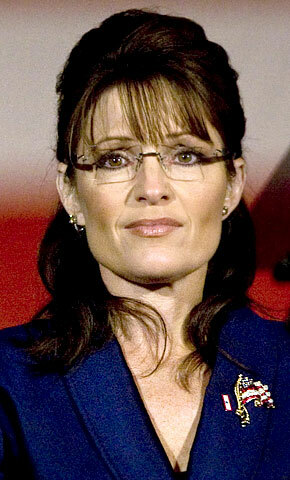 I cherish my independent political status, but a Palin candidacy for the presidency could make a Democrat out of me. Stupidity is the Devil, and I refuse to vote for the Devil. This entry was posted in US Government on 04/09/2010 by deanwebb.